We have chocolate addicts around here – healthy or not! 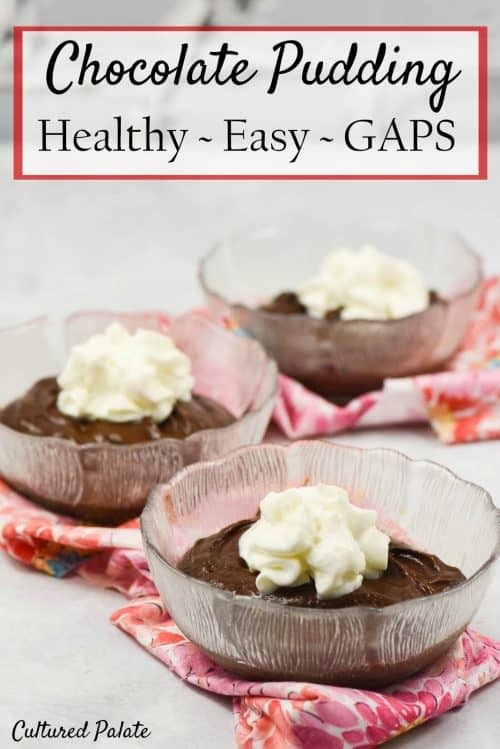 With Chocolate Avocado Pudding you get the best of both – healthy and delicious chocolaty flavor! My favorite part? It is easy peasy – watch the video and see for yourself! I am back on the GAPS Diet and this time to get rid of eczema. 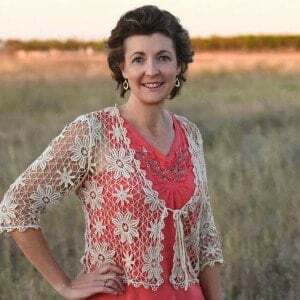 After having such amazing results with my first experience and no longer suffering from rheumatoid arthritis, I thought it was time to give GAPS a shot for another autoimmune problem. Putting my own twist on the healthy chocolate pudding (based on a dessert pudding from our time spent in Switzerland), it has quickly become a family favorite. For our family of nine, I quadruple the Chocolate Avocado Pudding recipe ingredients and process it in batches in the food processor. If our older children are visiting, well, let’s just say I make even more – we have hearty eaters around here! You might be thinking that this is an expensive dessert for so many people. But, I have a trick up my sleeve to make it more economical! Especially this time of year, I am able to find avocados on sale. I’m talking $.18 each! 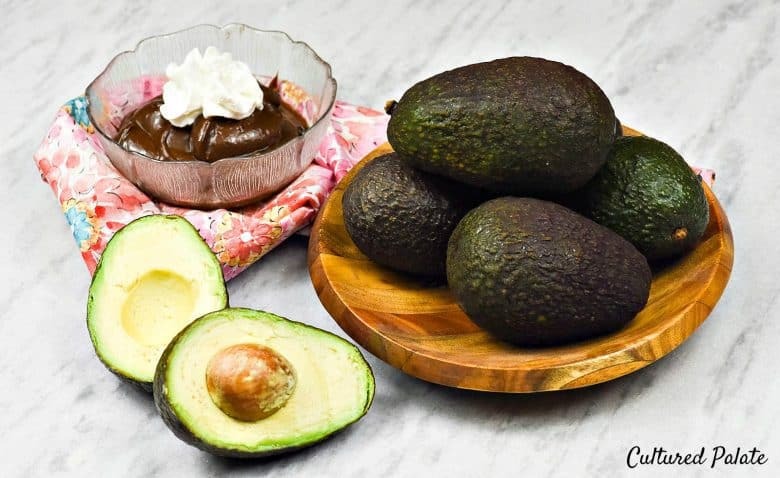 And, when I do, I stock up and freeze the avocados which works great in Chocolate Avocado Pudding – just thaw and continue with the recipe. I learn best by watching someone else. So, watch the video and see for yourself just how easy it is to make Chocolate Avocado Pudding! I love knowing what other people use and why they like particular products. Here is a list of resources that you see me use in the video and why I like it. The links will take you to Amazon. Cuisinart Food Processor – I use this kitchen appliance almost daily and it holds up to the use my large family puts it through – that’s saying a lot! Le Creuset Spoon Spatula – I normally use my spoon spatula to serve the pudding with because it scoops up just the right amount and makes scraping the food processor bowl easy – no need to waste any pudding by leaving it in the bowl! Buy avocados on sale and freeze them to make this a very economical dessert. See Freezing Avocados. Espresso and cream are completely optional. Espresso smooths out the flavor of the cocoa. Cream adds a special touch of richness but also increases the amount of finished pudding this recipe makes. As my 16 year old daughter put it, “it is hard to believe something that good is really healthy!” – It had everyone asking for more! 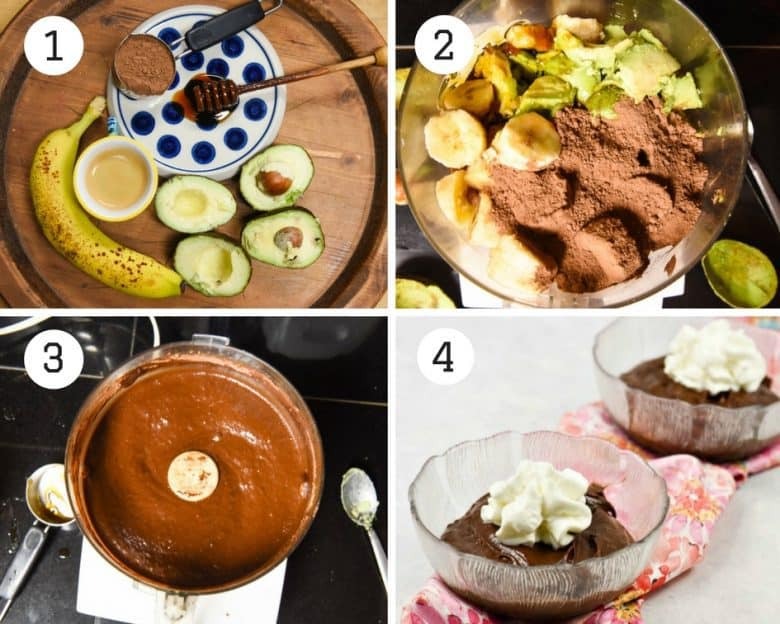 If you’ve tried Avocado Chocolate Pudding or any other recipe on Cultured Palate please take a minute to rate the recipe and leave a comment letting me know how you liked it. I love hearing from you! You can also FOLLOW ME on PINTEREST, FACEBOOK, INSTAGRAM, YouTube and TWITTER. Homemade pudding is great served with or without the optional cream. Combine all ingredients, except the cream, in the food processor and puree until everything is combined and smooth. Store in an airtight container in the refrigerator for at least 30 minutes just to chill it. When ready to serve, whip the cream and fold into the pudding. Buy avocados on sale and freeze them to make this more economical. See Freezing Avocados. This is one of my favorite avocado recipes – what is yours? I learn so much from your blog. That pudding sounds very interesting. (We love avocados!) I will have to do some more reading on that GAPS diet. Would I use the same amount cacao powder as your recipe calls for cocoa powder? Yes, Jan, use the same amount! Hi… I don’t like bananas is there something I could sub for the banana??? Brenda, I don’t know of anything because they help with the consistency and add sweetness. You might try it because it does taste a lot different than plain bananas. The cocoa and honey change the flavor completely. Let me know if you do! I think you will enjoy it. I would have never thought of this recipe! I tried it and it was wonderful! Hanna, I’m so glad you liked it – not only is it easy but is is delish! This recipe is so creative! It was delish! Tina, I’m so glad you enjoyed it. I first started making this while on the GAPS diet but now, well, I just make it because it is so good!